In mid-January, 2017 I passed the FAA Part 107 test on the first attempt. Although I was pleased to pass the test, my score, at 82, was lower than I anticipated. The following discussion will provide some food for thought for those interested in taking – and passing – this test. Who are You? How old are You? I’m in my early 60’s and have been self-employed my entire life. This means I never had to take tests…but rather I had to prove myself in the School of Hard Knocks. This has worked out well – but such a life does not prepare a person for the specific task of rote memorization and study needed to excel in new fields of study. To keep it short – if you are in college or have been in grad school or other similar ventures within the last decade, you will probably find the process easier. I my case, the last test I took was for HAM Radio and that was 35 years ago. If you are already a pilot or well versed in aviation norms, you will have a leg up. Same goes with those very familiar with weather and maps. In my case, I did have the benefit of having been a map aficionado for much of my life. This is not a test which is easy to ace. There is a lot of material involved and some of the specifics are exacting. There are many sites which provide the specifics of the study material…so I won’t repeat them here. However, keep in mind that you need to know details such as follows. In some cases, the air space up to a certain height (say 2500 feet) is FAA Controlled. A sample question might ask both what that height is – AND, whether it is UP TO or INCLUDING that height. In other words, you may have the general knowledge memorized (Class “X” airspace is up to 2500 FT), but forget whether it included 2500 Ft. or whether it was up to 2,499.9 feet. This is but one example where, in the real world, it makes no difference at all and yet your answer still must be accurate. The Program is laid out in a series of lectures which are also available in written form. Most importantly, a number of sample tests are available. Some of these are short and follow each section (lecture). At completion of the lecture materials, 5 full (60 question) practice tests were available. I allocated approx. 1 hour per day to watching a lecture and other associated study. Some days I may have spent as long as twice that doing practice tests and additional studying. My guess is that, depending on the individual, a range of 20-50 total hours of study is needed before you should sign up for your FAA Exam. The Exam is a series of 60 questions with a few extra sprinkled in (mine was 63). All questions are multiple choice with 3 possible answers. In other words, a child might score an average of 33 without any knowledge of the subject. This is quite an advantage as you only have to then get your score up from 33 to 70+. On my first practice test I scored an 84. After further study and another 6 practice tests I was scoring 90 consistently and, even then, some of my missed questions were simple oversights that more careful test taking might avoid. I even scored 100% on a few shorter 20 question tests. The actual FAA test was harder than most of the practice tests – mostly due to “word based” questions like exact meaning of CRM (Crew Resource Management) and similar material. Facts (maps, weather, rules) are easier to study for – but a lot of rote memorization is needed for the wordy stuff. So my advice for those who care about passing the first time through would be that they should score at least 84 to 90% consistently on differing practice tests before taking the real test. Or, put another way, they should leave at least 10-12% (min) of slop above the passing grade. (say 72 +12 = 84 which includes a little wiggle room. Given the time, cost ($150 is lost if you fail to pass the test) and our delicate egos, it’s important to understand that “just good enough” may not allow you to sail through this test. I hope the above has given you some hints and tips to make passing the FAA Part 107 test easier. 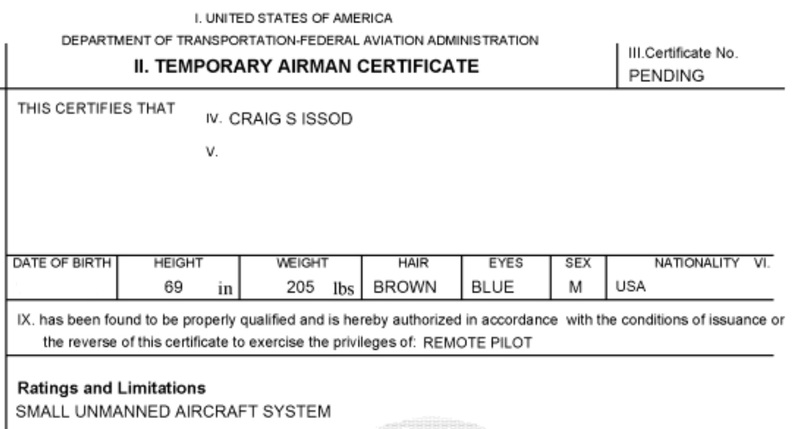 Temporary Certificate from the FAA received after test is passed and you file online.